Back in the saddle - Stop staring and start sewing! Well we're back from Legoland and everyone had a good time (especially a certain 7 year old boy). I'm glad we didn't pay full price though because I would have been demanding a refund. And that's all I've got to say about that. I finally got around to making something with this pattern I've had for a few weeks and I'm so tickled with the result. I finally weaned the baby a few weeks ago and I'm getting back to a normal "bosomage" so things are starting to fit better. 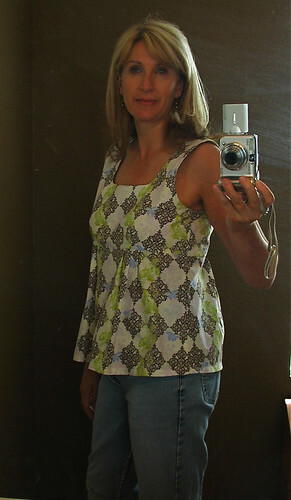 I will definitely be making a few more of these tops for summer. I love the fact that it's sleeveless but still provides good coverage. It's Simplicity 4176 and it's not out of print (bet you didn't see that coming)! I made the top in the main picture but added about an inch to the length. The example looked okay but I hate it when a top looks good and then when you lift your arms it exposes the horrifyingly jiggly results of 5 pregnancies. Eeeek. I love this fabric too. I got it at Bolt in Portland last summer and have been waiting for just the right pattern. I really love the fact that it has no zippers or buttons but still doesn't look or feel loose. It just has a few easy pleats and it went together pretty fast. 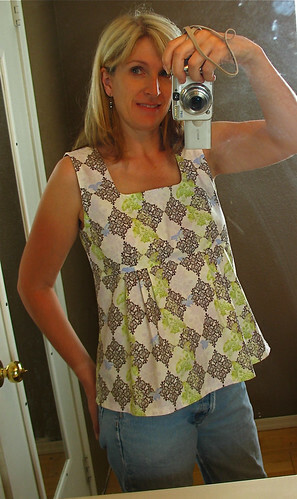 I did narrow the bodice at the top so the shoulders didn't tip out so much. See my sunburn? I always sunburn in other states but never in Arizona. Go figure. I'm very happy with this pattern and Joey liked it right away when he walked in the door tonight so that's a good thing too. Fun!